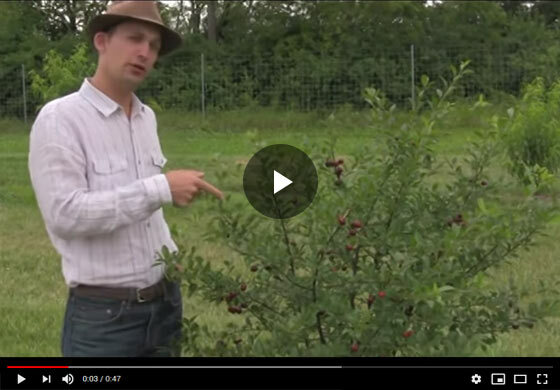 Gurney's horticulture expert shows off a Carmine Jewel bush cherry plant that's just started to bear fruit and speaks about the plant's fruiting habits. Hi everyone, Felix here with Gurneys and I'm really excited because this is the first year that we've had fruit on our Carmine Jewel bush cherry, in fact, the fruit you're looking at here are the first fruit to ripen in the U.S. on Carmine Jewel, and you can see it's still a young plant, we planted this in the fall of '07, right now, it's the spring, early summer of 2010, and you can see we have a nice crop load already on this dwarf cherry variety, and I'm really excited and impressed with the fact that we have this kind of crop load, so the nice thing is that in Saskatchewan, where these were bred, they ripen in the second week of August, and here in central Ohio is on five, we have ripening in early June, so we get nice early ripening, and this is actually ripening earlier than, about two weeks earlier, a week-two weeks earlier than our other tart cherries here, so they're a nice, early ripener for us. So, look for some of our other videos on how to care for your Carmine Jewel plant, pruning, container growing and join us for some other videos.